Third-party lenses have come a long way in recent years. Their optical performance and ergonomics have improved in leaps and bounds, and rather than just offering less-expensive alternatives to the lenses made by camera manufacturers, the third-party lens manufacturers can try something new. I'm focusing here on a case in point, Sigma's 150-600mm sports and wildlife lens. That's a very broad zoom range--much broader than any of Nikon or Canon's current offerings at the super-telephoto end of things. The specific lens I'm using here is the Sigma the 150-600mm F5-6.3 DG OS HSM | S (not to be confused with the Sigma 150-600mm F5-6.3 DG OS HSM | C). I've been very impressed with some of Sigma's recent offerings--I reviewed one of their new 35mm f/1.4 lenses not long ago. So I was very interested to put their flagship sports and wildlife super-telephoto to the test. In short, this is a super telephoto zoom lens with an unusually versatile zoom range, from 150mm to 600mm. And while it's not the fastest super telephoto available by any means, it's also much more affordable than most of the faster super telephotos. I was using the Nikon-mount version, but it's also available in versions for Canon and Sigma mounts. It will work on full-frame and cropped sensor cameras, and it's mostly only compatible with digital cameras (the film camera exceptions are the Nikon F6 and the Canon EOS-1V). It has surprisingly good weather-resistance, which comes in handy since chances are you're probably not using this in a studio. But it's also big and solid, so carrying it around all day requires some commitment. Camera manufacturers love codes and acronyms, and Sigma loves them more than most. The full name of this lens is the 150-600mm F5-6.3 DG OS HSM | S.
150-600mm: Pretty self-explanatory--it's the zoom range, from 150mm zoomed out to 600mm zoomed in. That's an unusually wide zoom range and adds versatility. F5-6.3: Some zoom lenses keep a constant maximum aperture throughout the zoom range. So a Nikon 200-500mm f/5.6 lens will have a maximum aperture of f/5.6 whether you're zoomed out at 200mm or zoomed in at 500mm. But many zoom lenses, like this one, have a variable maximum aperture dependent on the amount of zoom. So at 60mm the maximum aperture is f/6.3, while at 150mm it's f/5. DG: Designed for digital. But that’s not quite all there is to it. Basically it means that it works on full-frame cameras. Sigma uses DC for lenses designed specifically for cameras with APS-C sized sensors like Nikon’s DX cameras. DG lenses will work on full-frame, APS-C, and film cameras. DC lenses will only work on APS-C cropped sensors. Sigma has its DN lenses, which are for mirrorless micro4/3 cameras. And the DG lenses won't work with most film camera, with a couple of exceptions. OS: Optical stabilization. This helps keep the lens still, providing a practical benefit of a few extra stops if you're handholding or using a monopod where there's the risk of slight camera shake. HSM: Hyper Sonic Motor. This refers to the autofocus mechanism and trying to imply that it’s fast and quiet. Nikon’s version is Silent Wave Motor. S: Denotes Sigma’s “Sports” series. Basically, it distinguishes it from its “Contemporary” and “Art” ranges. At the time of writing, the only other lens in the Sports range is a 120-300mm. Overall, the Sports series lenses tend to lean more toward things like sports, action, wildlife, and general out-and-about photography where there's an emphasis on focusing speed and build ruggedness while still maintaining excellent optical quality. The Contemporary series tends to put an emphasis on convenience and versatility (like broad zoom ranges), while the Art series puts a premium on optical quality. The controls for the lens are pretty standard, with slider switches on the side near the mounting point. There are four main switches. The top sets the focus mode, with choices of autofocus, manual focus, or manual override. Under that is a focus limiter that can help speed up focusing. Basically, it limits the range that it will search for focus. If you're taking photos of sports action hundreds of feet away you don't want to waste the time of having the lens trying to search for focus 10 feet away. And vice versa. Under that is a choice of OS modes, from OS 1, OS 2, and off that lets you choose the best option for camera shake or panning. And finally, there's a custom settings switch, which is mostly when used in combination with Sigma's USB Dock (sold separately). The final switch on the barrel is a bit further down, and that's the zoom lock. I found that came in very handy. Under it's own weight, the lens extends if you point it down. So anytime I was carrying the lens without actually shooting with it, I found I had to engage the zoom lock. Here are some examples of what the zoom range is, from 150mm to 600mm. There's no getting around that this is a hefty piece of glass. You'll notice the weight in your camera bag. The lens alone, without the lens hood or any filters, weighs 6.5 lbs. When it's fully retracted, it has a radius of nearly 5 inches and is 11.4 inches long. Adding the lens hood adds considerably to the length and even some to the radius. With the vibration control system activated, it is actually possible to handhold this in decent light. But it's not really the best way to use a lens this long--you'll get far more consistent results using a monopod or some other kind of support. But in using this handheld I found that the vibration control works well. The focusing system is also very good. With a lens this large, focusing isn't going to be practically instantaneous, as it can be with a much smaller wide-angle lens, but considering its focus length it's snappy and true. I didn't run into much of a problem with it searching for focus, especially with the focus range lock being available. There is some vignetting, as you'd expect. As per usual, it disappears as you step down the aperture. Both of these were shot at 600mm. And in this shot I've deliberately exaggerated the contrast far more than normal to illustrate the shape and area of the vignetting. Overall, I found sharpness to be very good. It's a bit soft wide open, but the results are still very usable. Both shots are at 600mm, but it also shows other different optical characteristics at the extreme ends of the aperture range--both images have exactly the same post-processing applied (ie. none). Here are some samples of various types of subjects and image tones. All were taken using a Nikon D800 full-frame. One of the key features of this lens is that it is designed to withstand dust and splashes. And that's a handy feature for a lens that's most often going to be used out in the field, whether that's on the sidelines of sports action or in the wilderness shooting the wildlife. Sigma put together this impressive demonstration. But it's a solid lens and feels great to use. The casing is metal, and the zoom and focus rings feel true. It comes with a dedicated metal lens hood. As you'd expect from a lens with such a long focal length and narrow field of view, it's a pretty big lens hood--4.5 inches long. When you're not using it, you can unscrew it and reverse it back on the lens to save size. But don't lose it--the lens hood alone costs $121 as an accessory. It also comes with a dedicated soft lens wrap in place of a lens cap. It wraps around the front of the lens and fits with the lens hood on reversed--it won't fit properly without the lens hood. The lens is compatible with Sigma's USB dock system, but you'll have to buy that separately--it doesn't come with it. The zoom mechanism is a bit looser than I'd like. That's good for a smooth zooming, but it also means that if you point the lens down it will extend under its own weight. There is a lock, though, that becomes pretty essential. I happened to have the Tamron 150-600mm at the same time. Realistically, these aren't direct competitors--a more direct comparison with the Tamron is Sigma's version of this lens in the Contemporary line-up (see below). But for what it's worth, here they are side-by-side, with the Sigma on the right. Sigma pitches this lens at travel, nature & wildlife, and sports and action photography. That's a pretty broad swathe of genres, but the common theme is that there are moving elements, so fast focusing and the vibration control come in handy. And it's splash- and dust-resistance are very handy for a lens you're probably using in the field. Sigma has a similar lens to this in its Contemporary range. Their tech specs are similar, and its model number is identification except for the final letter: 150-600mm F5-6.3 DG OS HSM | C. The Sports version is a much better lens, but the Contemporary version has its own appeal. The Contemporary version is small, lighter, and less rugged (made of plastic). The Sports version is faster, heavier, larger, has better optical performance, and is almost double the price. You can find more side-by-side comparisons here. Even when it's not fully extended, the 150-600mm F5-6.3 DG OS HSM | S is a large and heavy piece of glass. It's not a lens you're likely to throw in your bag on a whim, and it's not something I would carry around for general walking-around travel photography. For that you're probably better off looking at the version in the Contemporary range. But for those situations where you do need a fast, sharp lens with a lot of reach, like sports or wildlife, the Sigma 150-600mm F5-6.3 DG OS HSM | S provides excellent results and versatility at a surprisingly reasonable price point. 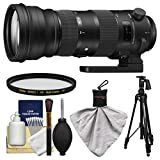 The Sigma 150-600mm F5-6.3 DG OS HSM | S has a manufacturer's suggested list price of $1,999, and you can find them at B&H Photo and Amazon and available in Nikon, Canon, or Sigma mount versions. I had the 80-400 VR, Mark II, but wasn't totally pleased with it, so eventually I sold it, and had two to choose from, which at the time cost exactly the same here in Sweden: the Nikon 200-500, or the Sigma 150-600 Sports. Tried them out in my photo shop, and without lens shades on they weighed roughly the same, but the focusing with the Sigma was almost instant, and spot on, as far I could judge there and then. The Nikon was a bit more hesitant, but not much. Now I have had my Sigma half a year, or so, and it has been a delight, if a wee bit heavy! Less portable than the old 80-400, but none of the issues it had, either! It is especially good on the Nikon V2, to my surprise, and that even with one TC. On my DX and FX cameras it can handle two TCs with ease! Definitely not something the 80-400 handled, no matter what camera was attached! I rented the S version and love this lens. I want to buy it, but I would like to know what camera bag/backpack fits this lens. I don't put my gear in checked luggage while flying. Thanks.